Jason Palmer is regional technical sales manager for Delta Computer Systems Inc., Battle Ground, WA; 360/254-8688, www.deltamotion.com. Fig. 1—After the wheels are pressed onto the axle in the Mittler Brothers press, bearings are pressed onto each end of the axle. 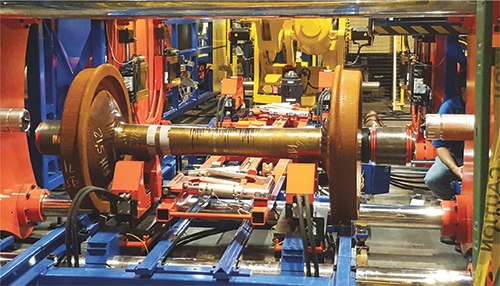 Machine builders that need precision hydraulic motion control, coupled with data acquisition during the machine cycle, can benefit more from a customized electro-hydraulic motion controller than from a PLC. An example are wheel-and-axle assemblies for the railcar-manufacturing industry. The process of attaching wheels and bearings to axles must meet the strict specifications of the Association of American Railroads (AAR), which requires that, in addition to making sure that precise assembly measurements are adhered to, a record is kept of the forces encountered during the pressing process. One supplier of assembly machines tasked with meeting these exacting requirements is Mittler Brothers Machine & Tool Co., Wright City, MO. Mittler, which makes equipment and tooling of all types, builds machines for railcar-wheel assembly in two sequential steps. First, the wheels are pressed onto the axle, one at a time. Then, bearings are pressed onto the axle, one on each end, while keeping the axle centered during the process. A completed assembly is shown in Fig. 1. Mittler, which had produced such a machine years ago, was recently contacted by a North American railcar company to produce a new machine, which provided Mittler’s design team with the opportunity to upgrade its hydraulic controls. The previous system worked, but the wiring of its analog hydraulic control module was complex, and the programming of the PLC that controlled the overall motion was difficult. Plus, the company wanted to incorporate an automatic means of making sure that the axle is centered in the press during the bearing-assembly operation. This new approach required an upgrade to the PLC and the incorporation of a new digital electro-hydraulic motion controller. Fig. 2—The RMC151 motion controller installed in a redesigned assembly press can control and synchronize as many as eight axes simultaneously, and contains a built-in Ethernet interface. 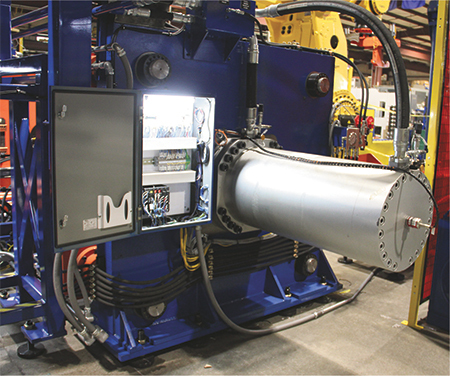 At the recommendation of Mittler’s local hydraulic distributor, John Henry Foster Co., St. Louis, MO, the Mittler Brothers team selected the RMC150, an eight-axis controller with special capabilities for precise closed-loop control of hydraulic systems (Fig. 2), from Delta Computer Systems, Inc., Battle Ground, WA. Fig. 3 shows the RMC151 in the electrical panel to the left of the 16-in. bore cylinder in the wheel press. With the new motion controller in place, the two-phase manufacturing process has been successfully automated. In the first phase of the operation, when the wheels are attached to the axle, the RMC receives inputs from position transducers mounted in the wheel-press cylinders, pressing the wheels, one at a time, onto the axle journals until precise target positions are reached. During these operations, the motion controller monitors the force exerted by computing the differential pressure between pressure sensors mounted in each wheel-press cylinder on either side of the piston. The pressures are logged and the data are retained in an information log kept for each axle. The second phase of the assembly process involves attaching bearings to the axle, one on each end, outboard of the wheels. It is critical for the axle not to shift while the bearings are pressed onto it from each end. Sensors were added, enabling the RMC to monitor the axle’s position, press velocities and forces exerted, while comparing them against setpoint values. The RMC refers to this information as it performs calculations required in order to keep the axle centered during the bearing-press operation. Fig. 3—The new multi-axis motion controller can be seen in the bottom left of the electrical panel, mounted next to one of the 16-in. bore hydraulic cylinders used in the railcar-wheel press. One of the most complex tasks involved programming the motion controller to keep the axle centered during the bearing-press operation as a net force of up to 100 tons was applied. “The Delta controller greatly simplified the programming to center the axle to achieve this specification,” says Heinrich, who made full use of the many features of Delta’s RMCTools motion-control software package. These include Plot Manager, which captures and plots all key motion parameters during a move operation, enabling the comparison of the actual motion with the desired motion profile. The goal in tuning the motion is to make changes to the closed-loop gain parameters to reduce the error between actual and target profiles. The tuning process is further simplified by a Tuning Wizard feature, also included in the RMCTools package. Heinrich did most of the programming and tuning and was assisted by Delta’s field engineer during system tuning. As mentioned previously, one of the key requirements imposed on railway wheel-and-axle assembly manufacturers is the need to keep detailed per-assembly records of the pressing process. The apparatus for doing this in the old system was complex, and using the Delta controller in the new system implementation is much simpler. 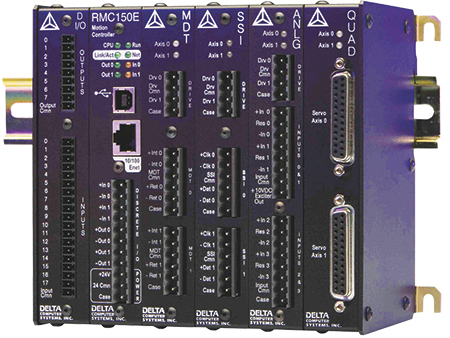 In the new system, wiring and setup of the data acquisition function are simplified because the PLC can download all motion programs into the Delta RMC via Ethernet. The press data recorder can upload all motion parameters from each press operation directly out of the Delta RMC data registers, using a register-mapping feature, via the controller’s built-in Ethernet interface. By using a powerful motion controller, with built-in support for pressure/force control and position control, Mittler Brothers was able to streamline the motion controls of this multi-stage press. Data acquisition also was made easier by choosing a motion controller that facilitates data acquisition for the motion operations.